Toasted marshmallow is a popular camping food. It even has a holiday of its own. The National Toasted Marshmallow Day is celebrated on August 30. Marshmallow is a type of sugar candy. It originally was a medical confection made from Althaea officinalis, the marshmallow plant. In its modern form, marshmallow is typically made with sugar, gelatin, and corn starch. 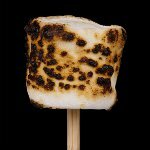 When toasted or roasted over open flame, marshmallows develop a caramelized outer skin with a liquid layer underneath. Toasted marshmallows are a popular backyard and camping tradition in English-speaking countries. To make a toasted marshmallow, one needs to place a marshmallow on the end of a skewer or stick and hold it carefully over the fire. Some people prefer their marshmallows gently toasted and some like a charred outer layer which is achieved by igniting marshmallows. Some people eat toasted marshmallows whole and some eat the outer layer and toast the rest of the marshmallow again. Toasted marshmallows are also often used for making s'mores. A s'more is a campfire treat that consists of a slab of chocolate and a toasted marshmallow sandwiched between two graham crackers. To celebrate the National Toasted Marshmallow Day, make a campfire and indulge yourself with this sweet treat.